This set includes 8 generators of snow, harsh sky, merciless ice Tornado interacting with physical objects, Sprite sheet with 64 textures of snowflakes, sounds of wind, tornado and rain. A particle system that works with a single snowflake texture and simulates calm snowfall. A particle system imitating realistic snow falling on the surface and slowly melting. Very heavy snowfall provided by a single particle system. To the thick snowfall, a subsidiary system of particles creates a fog. The weather deteriorates even more and a strong, howling wind is added to the snow in thick fog. This tornado with the interaction with physical objects. All items that fall in his field of action will be tightened, twisted and thrown out of its limits, and the accompanying sound will add realism to the scene. From the terrible, glittering clouds on the ground falls snow and rain. This weather phenomenon is reinforced by the corresponding realistic sound. 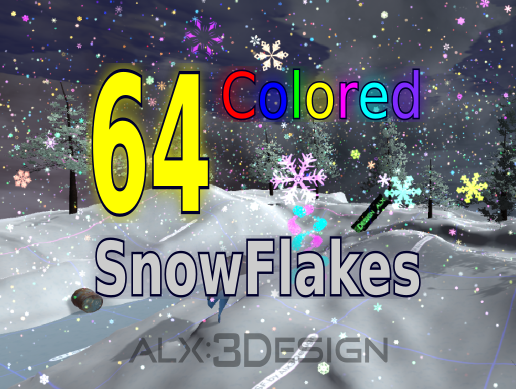 These are 64 magical multi-colored snowflakes falling from a dark moving cloud and lying on the ground. It is magically fabulous.